Saramonic SmartMic+ is a professional compact and lightweight, high-quality directional microphone specially designed for iPhone, iPad, iPod Touch and Android Devices with 3.5mm TRRS audio input jack. Saramonic SmartMic+ is a professional compact and lightweight, high-quality directional microphone specially designed for iPhone, iPad, iPod Touch and Android Devices with 3.5mm TRRS audio input jack. Its flexible mounting bracket accommodates a wide range of smartphones, it can be fitted for primary camera or front camera 'selfie' use. A 3.5mm headphone jack on the rear allows for play-through of audio while recording (app dependent) as well as easy playback of your videos without having to remove the microphone. The Saramonic SmartMic+ includes a deluxe foam windscreen for shooting outdoors or in adverse weather. The Saramonic SmartMic+ is also your unobtrusive, go anywhere solution for adding high-quality audio to your iPhone, iPad, iPod Touch, Mac or Android Devices. Take your mobile film making to the next level without sacrificing portability. Capture high quality audio with enhanced clarity and sensitivity without resulting to bulky, obtrusive microphones. The Saramonic SmartMic+ is battery free, plugs directly into your iOS or Android products, and is small and light enough to fit in your pocket. 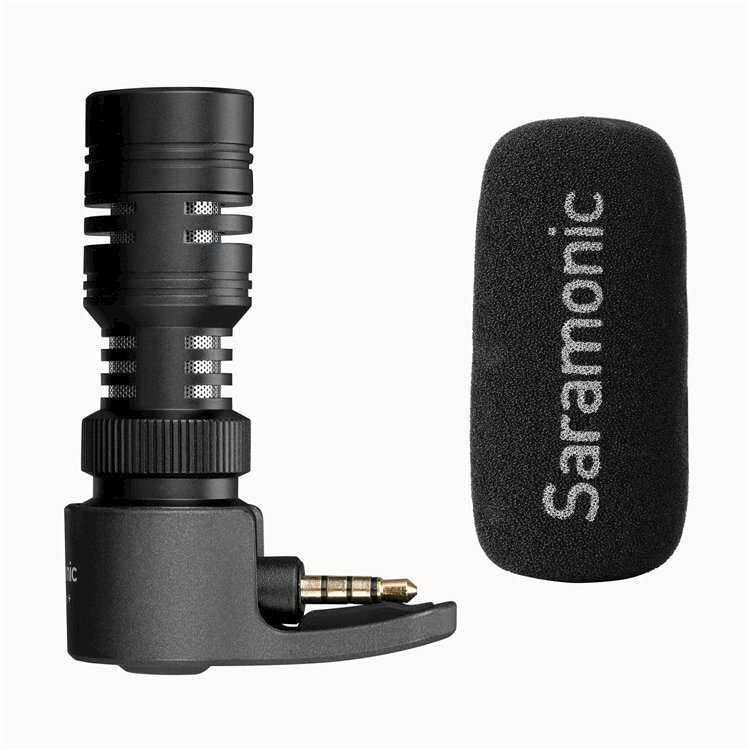 Weighing less than 1 ounce and featuring a flexible multi-directional head, the Saramonic SmartMic+ is perfect for musicians, journalists or just on the spot recording!